Early bird tickets are now on sale for the finale of the UK's biggest Gospel talent show, Time2Shine but ONLY until THIS FRIDAY! Join our judges founder MercyB, the incomparable producer Mark Beswick, TV personality Angie Le Mar and MOBO Award winning Guvna B as the Time2Shine finalists perform with some of the UK's biggest Gospel acts including Lola Godheld, Utter Once, Tripple O, Victizzle and Jay Ess! 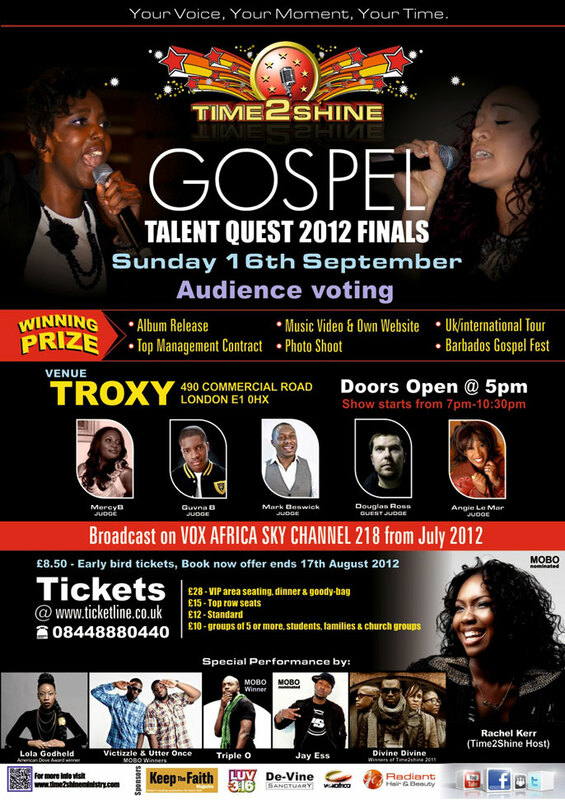 This musical extravaganza presented by the incredible Rachel Kerr takes place at The Troxy on Sunday 16th September! Join us for an evening of worship and entertainment as our finalists pull out all the stops to become Time2Shine champion 2012! DON'T DELAY! Get your early bird tickets now as once they're gone, they really are gone! Be a part of our spectacular finale which is one of the jewels in the UK gospel calendar!